“Never try things on models,” Bonnie Cashin once said. “They look great in everything.” In the 1970s, however, Cashin gamely modelled her own caftan designs—because the caftan looks great on everyone. Gauzy and trending now, as it does every summer, we trace the rise of caftan chic. The gauzy long-sleeved garment ranges from hip to ankle length and the name is Persian in origin – from about 600 B.C.. Its ethnographic origins trace back to Mesopotamia, where opulent versions were worn by Ottoman sultans, but variation on the robes and tunics have been worn throughout history by many cultures, usually in the fabric, prints and folkloric embellishment typical to their region. In oppressive heat, loosely covering the body in lightweight fabric creates air (and shields limbs from the harsh sun). Although at the turn of the last century Venice the designer Mariano Fortuny crafted them in pleated silk and gilded velvet, it took decades and a uniquely influential fashion editor to truly anoint them in style. Now the caftan is modern fashion’s foremost index of warm-weather insouciance. And you can thank Diana Vreeland for that. When she gushed over Moroccan caftans in the 1960s and featured designer versions in Vogue (like the kaleidoscopic Pucci ones modelled by Verushka and Simone D’Aillencourt), designers followed suit. Soon, Dior’s Marc Bohan made them in lavish and colourful lace and Oscar de la Renta was bejewelling caftan necklines for his clients. By the 1970s drama Lizaset on Corsica, Catherine Deneuve was wearing gossamer white caftans by Yves Saint Laurent, who also wore the garment himself (usually while in repose as his Majorelle vacation home in Morocco). 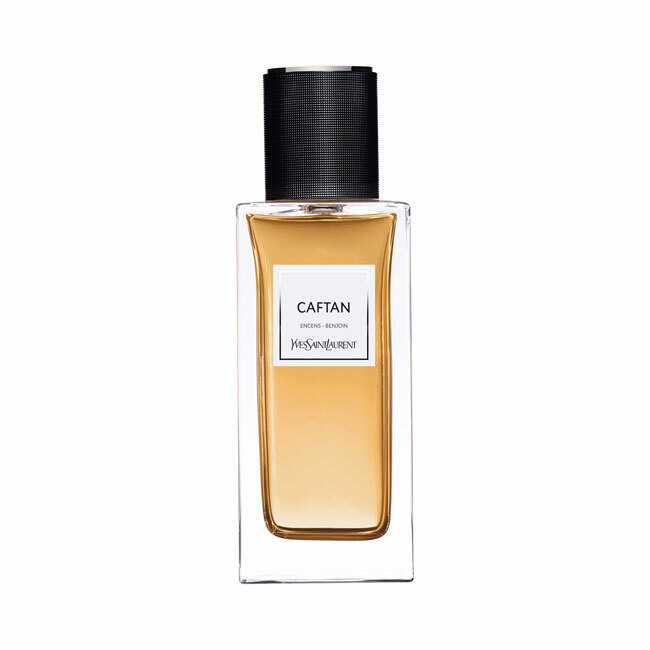 Saint Laurent is so associated with this Left Bank bohemian style, in fact, that YSL Beauty now offers a heady perfume called Caftan ($280 at yslbeauty.ca). From crunchy granola to wealthy bohemian, just one glimpse of a caftan and you immediately think ‘vacation.’ Some of that’s because of the garment design itself — contemporary interpretation involves ample ankle-grazing length and roomy, often flared long sleeves that aren’t exactly the most practical of garb. (No heavy machinery operating, that’s for sure.) Because of the voluminous nature of the silhouette, it’s not a garment of work but of rest — of lounging and leisure. And that’s why you should never, ever wear a caftan to the office or to work. The caftan effect depends on where and when when you wear it – you can dress it up with chunky earrings and flat sandals for a night out or dress it down to entertain on the back deck or dock barefoot and with no jewellery at all. As a general rule, though, less is more. The rest of the caftan’s louche, indolent connotations come from cultural association, chiefly from jet set iconography. With or without a wind machine, a caftan is voluminous and photographs dramatically, hence the many, many fashion images: of Joni Mitchell and Marisa Berenson, socialites Lee Radziwill, Marella Agnelli at Truman Capote’s 1966 “Black & White Ball” or the supreme caftan image: of doomed heiress Talitha Getty on the rooftop of her Marrakesh villa, forever young and glamorous. Men wore them too — from the Beatles to singer Donovan. After donning a slew of seductive caftans in her 1963 extravaganza Cleopatra, Elizabeth Taylor wore caftans the rest of her life. She usually cinched them just below the bust (at the smallest point of the rib cage) for maximum figure flattering. In the auctions of the late actress’s personal effects, the caftans ranged from metallic chiffon and slinky jersey to embroidered linen and ornate brocade by designers like Pucci, La Mendola and many by caftan designer queen Thea Porter. Which is what makes Taylor the queen of my (still theoretical) Caftan Royalty Hall of Fame. Caftans seem to have been her second-favourite thing to collect (after diamonds and gemstones) and varied from casual styles for travel to the elaborate versions she often wore in lieu of a traditional formal evening gown. 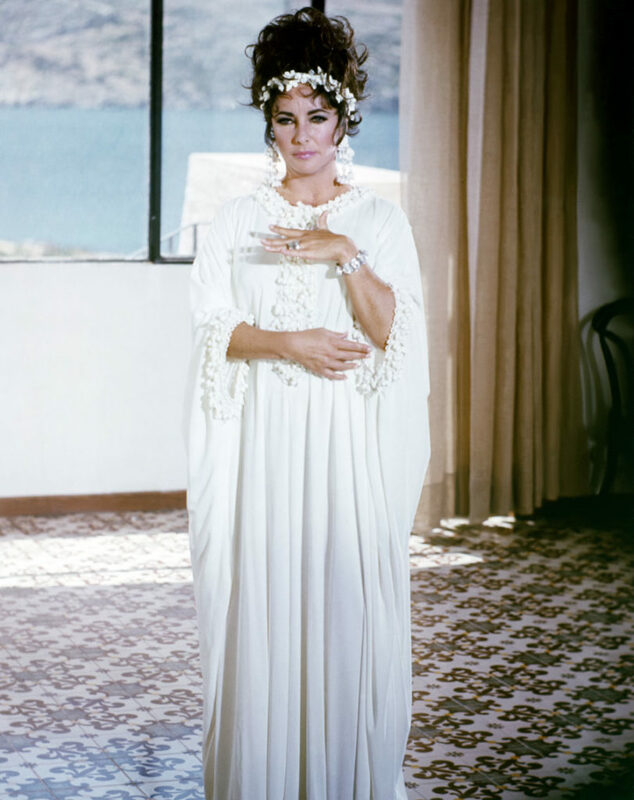 One of my favourite Taylor caftan moments is when she cavorts around a minimalist Sardinian villa in the 1968 camp classic Boom! (based on Tennessee Williams play). Her character’s entire wardrobe is white, including the beaded caftan Taylor wears paired with an enormous floral headpiece by Alexandre de Paris for a terrace dinner scene with Noel Coward. Even that caftan has a designer pedigree: all the film costumes were by by the Italian label Tiziani of Rome, which at the time was being designed by Karl Lagerfeld. If relaxation and ease are the caftan’s main symbolic value, that’s embodied in the pink caftan Emma Thompson wears as author P.L. Travers at the end of Saving Mr. Banks, when she finally unbuttons her formal attitude to life. But for most, the image that rules caftan iconography will always be Three’s Companywisecracking landlady Audra Lindley, with her gumball jewellery and omnipresent cocktail. Her character Mrs. Roper made the caftan a daily uniform, to indicate the depths of her leisure as a retiree in sunny San Diego, as has become an icon of the outfit. As newspaper publisher Katharine Graham in The Post, Meryl Streep makes her company—and the movie’s— life-changing decision as she’s hosting a party. 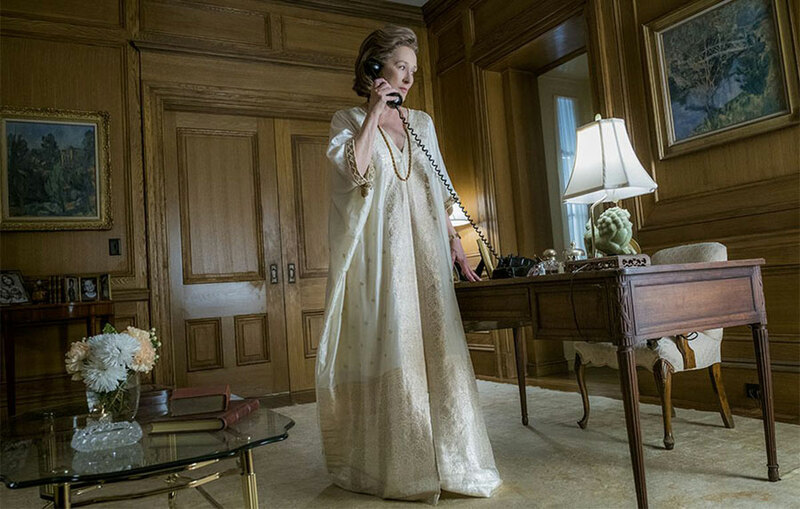 In the pivotal scene of Streep on the whole standing in her office resplendent, her power suit isn’t a suit at all: it’s an evening caftan of pale gold Indian silk (see below). Graham is attempting to fit into the male-dominated corporate world and putting her in the least tailored, most traditionally feminine outfit of the movie might seem counterintuitive but asserting her identity through that golden gown makes the scene that much more powerful. That wardrobe decision was made by costume designer Ann Roth, 86. She’s the Academy Award-winning legend behind many indelible Broadway plays and movies like The Hours, The Talented Mr. Ripleyand The English Patient,and you might say she’s lately revived her penchant for the caftan (the 1979 movie Hair is another of her credits, no surprise). In her one-woman show about acerbic talent agent Sue Mengers in an ice blue caftan by Roth and most recently, Annette Bening encapsulates the Chekhovian languor of a posh country house weekend in The Seagull wearing a delicate ivory caftan. Until Roth launches a caftan line us mere civilians can wear, here are a few of our new favourite caftan finds. There really is a J. Peterman, not just on Seinfeld) and the always-entertaining J. Peterman catalog offers caftans in cotton, denim and for the holidays, velvet (from $78, jpeterman.com), with a side of wit. And at Hudson’s Bay, look for DKNY, Free People and H Halston. Etsy and your local summer thrift market are a good start. But if iconic 1960s fashion shoots pique your interest, it’s best to keep an eye on Canada’s own vintage designer maven Cherie Balchand her online shop Shrimpton Couture (ShrimptonCouture.com). Her savvy celebrity clients like Tracee Ellis Ross and Kate Hudson know that caftans by the designers who made the look fashionable are eminently collectible — watch for Ossie Clarke (with prints designed by then-wife Celia Birtwell), unusual colour combinations by Zandra Rhodes and any flowing ones by Thea Porter. A rare Porter caftan from the Shrimpton Couture archives was featured in the 2015 landmark “Bohemian Chic” retrospective at England’s Fashion and Textile Museum. Shrimpton Couture is also a source of inspiration for how to make caftans chic for different occasions — a day at the beach, a walk in the woods, a glam night out — through choice of shoes, jewellery and accessories for maximum versatility. Balch adds new vintage gems from designers like Oscar, Pucci, and Missoni every week. Because prestige fashion exhibitions are well and good, but caftans are meant to be enjoyed — cooling the body from the heat of summer, preferably accessorized with a refreshing drink in hand. Long live Mrs. Roper!